Throughout the history of progressive management, Lean tools have been valued by leaders far more than they have valued the human relations practices that must accompany the tools. This is because tool are seen as a form of capital; a type of useful equipment that unambiguously helps improve productivity. In contrast, most leaders view the human relation practices as disconnected from productivity improvement. Anything not obviously recognizable as capital and which can significantly improve productivity is ignored. This includes principles and practices whose intent is to improve human interaction (inter-departmental and inter-organizational teamwork) and humanize the workplace. Today, however, we understand progressive Lean management better than ever, from both the traditional tool and long under-appreciated human perspectives. My early work (ca. 1995) focused explicitly on transforming the “Respect for People” principle from something understood by people as abstract into something tangible that people can understand and practice just as concretely as they practice Lean tools. I took the Lean tools common used in operations are created practical analogues for improving leadership. This work is described in detail in the papers: “Continuous Personal Improvement,” “Lean Behaviors,” “Linking Leaders’ Beliefs to Their Behaviors and Competencies,” “Using Value Stream Maps to Improve Leadership,” “Leaders Lost in Transformation,” and “Standardized Work for Executive Leadership,” and culminate in the workbook Practical Lean Leadership (2008) and Speed Leadership (2015). It s important to appreciate what I have done. For more than 100 years, the “Respect for People” principle (and its antecedents) was thought to be an abstract concept that only the leaders who possess certain types of personalities could comprehend and practice – and that it was a main reason why good examples of progressive management practice were so rare. My work breaks this long, unhappy tradition and makes concrete what leaders need to know and be able do to achieve Lean success. I have turned the people-side of Lean management into Lean capital; something useful that unambiguously both improves human productivity and capability, and also amplifies technical (process) productivity. 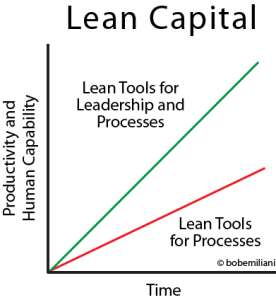 The image above illustrates what is gained when workers use Lean tools for processes improvement compared to what can be gained when Lean tools are more broadly applied by leaders to improve leadership and processes. Like Lean tools, some training and a lot of practice is needed to know what to do and to be able to do it well. That is the new leadership challenge.